The Rebel Sweetheart. : Spotlight | Swish Fresh Breath Saver Pack. Once upon a time, I was a smoker. And not just any smoker, mind you. I was a chain smoker. What started out of curiosity during my sophomore year in high school became one big bad habit that lasted for thirteen years. If not for my little man, I would have not been able to quit cold turkey. I stopped smoking in 2008 - the moment I learned I was five weeks pregnant with my son. Receiving this Fresh Breath Saver Pack from Swish reminded me of the days when I used to smoke one pack (perhaps even more) of cancer sticks per day. Ugh. Kids, do not try that (I mean smoking) at home, or anywhere else for that matter. Lol. Swish Breath Saver Pack + Vanity Pouch. Back then, you'd always find a bottle of mouthwash or a breath spray stashed in my bag - together with a pack of cigarettes, a lighter, a hand sanitizer (you know, to keep my hands from smelling like burnt cancer sticks), and a bottle of perfume (to mar the smell of smoke on my hair and clothes). Swish Breath Spray, Php 109 each. Breath sprays, such as this one from Swish, make for a quick breath fix. Just one or two pumps would be enough to eliminate bad breath caused by smoking. They come in a handy dandy packaging that fits even tiny fob pockets (as in the right-hand hip pocket in your jeans). Hence, they're pretty easy to lug around wherever you go. Mouthwashes, on the other hand, provide longer lasting fresh breath. This one from Swish is equipped with the Surefresh Technology which not only helps kill bacteria that causes bad breath, but also prevents plaque build-up, gum disease, and tooth decay. Swish Mangosteen Mint 120 mL, Php 78. Like the other Swish Mouthwash variants, the Mangosteen Mint flavor is alcohol-free, which allows you to gargle for a good 30 seconds without the burning, stinging sensation in your mouth. Gargling with it twice a day leaves your mouth with round-the-clock freshness. Now just because I've been nicotine-free for five years now doesn't mean that I have no use for these products anymore. I still keep a breath spray in my bag, and mouthwash bottles are a common sight in our bathroom.Because you know, bad breath is not caused by smoking alone. It can also be caused by eating and drinking. With that in mind, Swish launches its 'Say Swish Campaign 2013'. 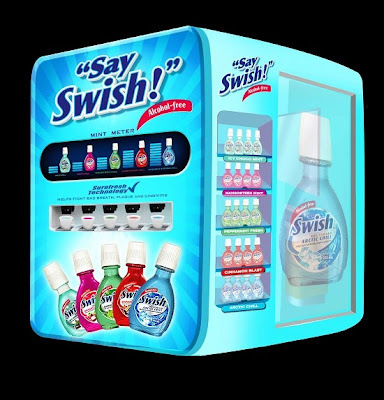 Freebies such as photobooth souvenirs and other premium items will be given upon purchase of any Swish product. And if you're really lucky, you can chance upon Swish endorser Ryan Agoncillo during the 'Say Swish' activities. Get to know more about Swish products and the 'Say Swish Campaign' by liking the Swish Philippines Facebook page! Kudos for you for kicking a bad habit for the sake of your child! I know several people who have tried to give up smoking unsuccessfully. It's a testament to your love for your child that you were able to beat your addiction. I'm not a smoker, but I am a coffee drinker. So I love mouthwash and breath spray for my own reasons. Thanks for sharing this! Those are some interesting flavors! I don't think we've got that here :( I agree with what you say about kids. Smoking is not cool! Don't do it! At my son's school, the kids tend to chew. UGH! If I ever catch Kyle chewing he's grounded for life! Swish certainly looks like a good product to keep on hand! I quit smoking as well, but I've gotten used to surrounding myself with "fresh breath" items! i really like the spray version. very cool. wow! i really wanna try that breath sprays, swish is really nice. I never smoke ever. I tried once but I did not like haha . I love the Swish spray super not stingy . Perfect for travelers! Ang cute naman ng pouch!! I also tried Swish and it's really refreshing and very handy. That breath spray is perfect for those all-important romantic dates. You simply have to be ready to kiss anytime! Yes I still smoke--for I won't even tell you how many years!! Thus this would come on very handy on occasion. Wow, first time I've encountered Mangosteen-flavored mouthwash!